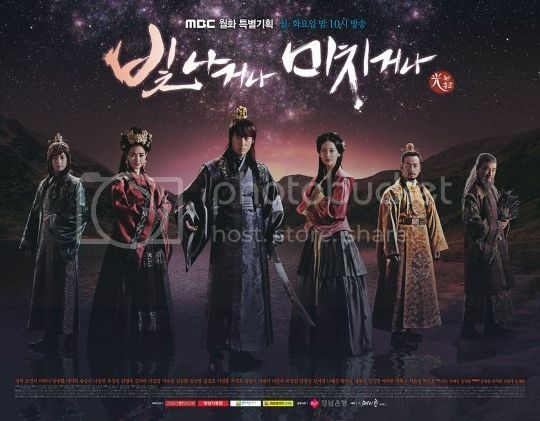 Shine or Go Crazy is the fantasy romance melodrama set in the Goryeo dynasty, and Jang Hyuk plays an actual historical king (Goryeo’s fourth), although the show is pretty up-front about being fictionalized and taking massive creative liberties. 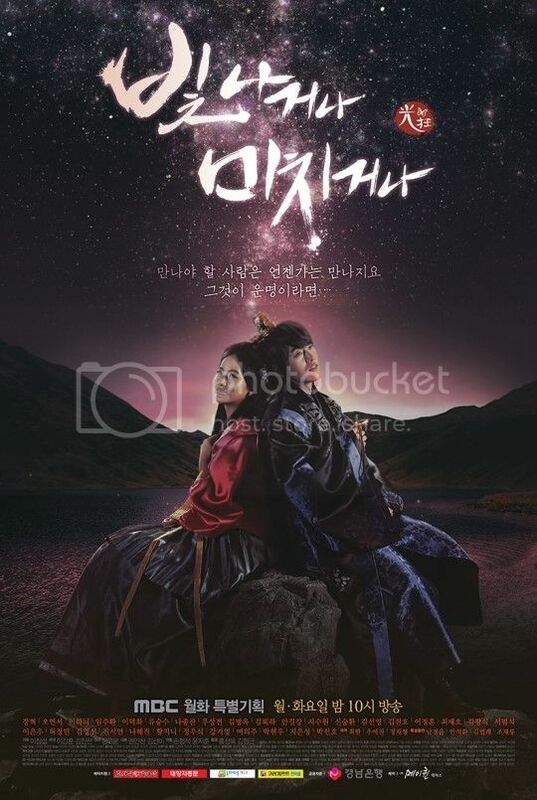 The story really hammers in the fated/cursed theme between the lovers, with Oh Yeon-seo playing a princess who falls into a love triangle with Jang Hyuk and his half-brother (played by Im Joo-hwan), who has his sights on stealing both our hero’s crown and ladylove. The tagline in the posters reads, “People who must meet will end up meeting someday. That is fate.” Just in case the fate message hadn’t come across yet. 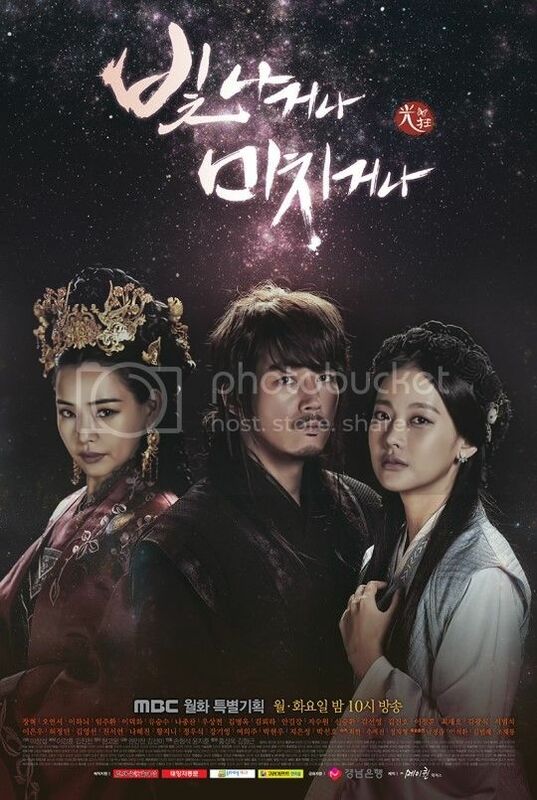 The more I look at them, the more the posters start looking the same, so I wish they’d mixed it up more design-wise… but more than that I wish Jang Hyuk were photographed with better hair. I mean, he’s no stranger to crazy hairstyles in the name of character work, but the posters aren’t really doing him any favors, are they? At least we’ve seen him looking better in action in the show’s initial teasers. The drama is intending to kick off its early portion with upbeat romantic comedy elements (which explains the lighthearted meet-cute in the previously released teaser), but will then turn its focus to a more heartbreaking melodrama. 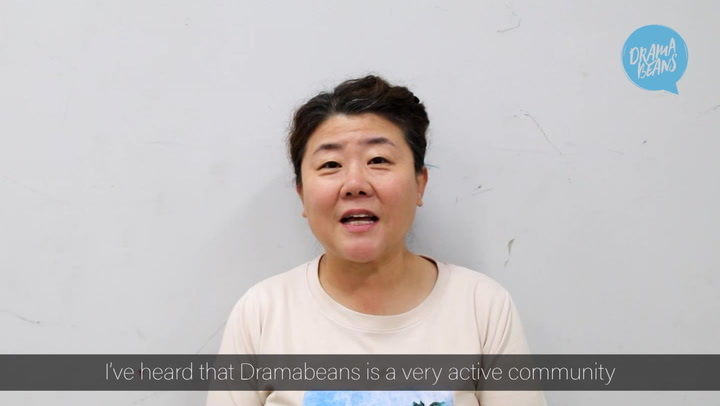 Not that that was necessary, since we pretty much expected that — that’s the standard format of most dramas — but they’ve gone ahead and made that the explicit roadmap. 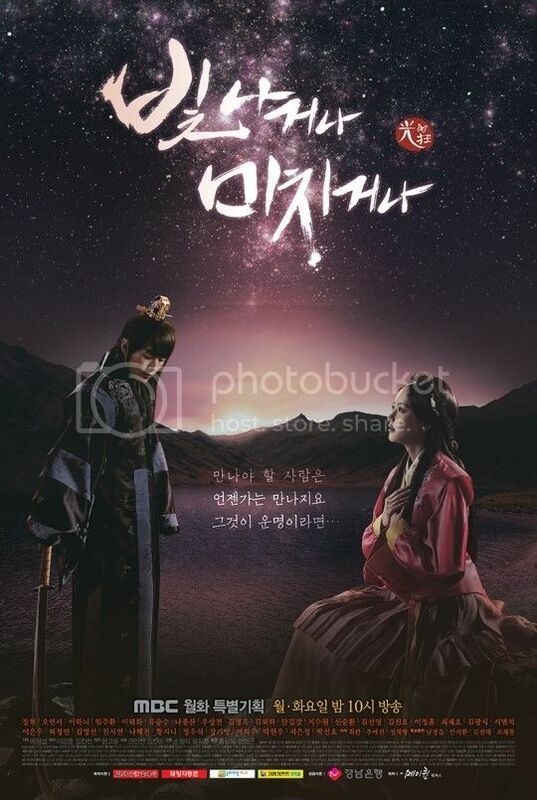 Shine or Go Crazy will premiere on January 19 and will air as a Monday-Tuesday drama to follow Pride and Prejudice. Another rom com! Wohoooo! ? Too bad, no one will recap this. Love the title, I thought it would be interesting then I got busy, I forgot to watch until it's already on its 6th episode. Watched it in one go! That's how good it was. Jang Hyuk in his element! Honey Lee is ROCKIN' the gold tiara up there! Best headress since the antler crown in Night Watch! It's more like Jang Hyuk's hair announces Shine or Go crazy.. with Jang Hyuk, haha. I love Jang Hyuk but based on the posters it kinda makes me not want to watch it. Might give it a go though. Wait a minute... that's Do Min-joon's line! The teasers are fun too and i totally love the costumes they are giving the female leads. Diff from the typical hanbok, they just look stunning. Here is the teaser, i totally can't wait esp it's based on a popular novel with the same title. More than the hair, it seems that they have been photoshopped excessively to the point where the features them recognizable are now erased. Is the other woman Park Si-yeon...? Pride & Prejudice got the highest ratings in its last episode against Healer and Punch, and SOGC has the Sanguek advantage and the leading ladies advantage. It all comes down to Jang Hyuk's ability to attract female viewers and keep them. Not sure what you mean by leading ladies advantage? anyways, P&P did have the highest ratings in its last episode, but it was only by .1%. And the last episodes usually have last episode buff..and immediately before its last episode, P&P was having the lowest ratings of all. I don't think SoGC is having advantage, it's gonna be a hard fight. Esp when both Healer and Punch is getting good responses. I view this more as a test for OYS for her ability to lead a weekday drama. JH proved himself several times in dramas, but for OYS it's her first time and first chance. Jang Bori was a weekend drama, and most people were more impressed with LYR. I hope she does prove herself and secure her position, since I find her very pretty and likeable. Still wish Honey Lee were the main lead. For me, life doesn't get better than Jang Hyuk playing a bad boy in a sageuk. I love the long hair look (I"m an ild hippie, really) and he's funny, endearing and still brings depth to his roles. This is a quick ride to heaven for me - stars and all. The rest of the cast is first rate. I'm tired of Punch and healer (altho less so Healer) already, so this is a relief. I was afraid I'd have to go back to American TV! I really dig JH and would love to see his masterful movements in sword play but - was it the director or the cameraman who gave us close ups of the stars' mustache instead of his graceful and powerful thrusts and parries? Hey, director man --- there ain't no balconies in TV. And JH isn't it time you can get what you ask for? Tell'em to move those cameras back, please.